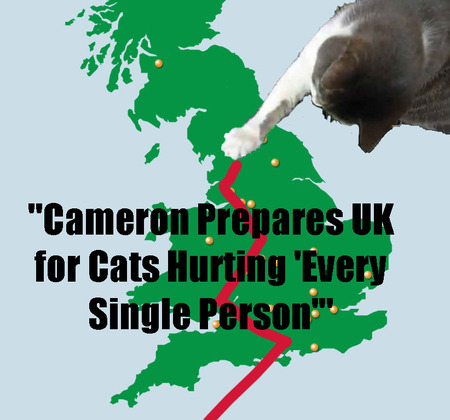 Nothing like a silly cat joke to defuse the atmosphere of economic doom that is swamping the United Kingdom. We’re all worried what David Cameron’s spending cuts will hit – jobs, schools, hospitals- but instead of giving into anxiety, some people are taking active measures to improve the situation. Okay, not the economic situation, but make themselves feel better anyway. As several people on Twitter have pointed out.. if you replace “cut” with “cat” all those grim headlines describing the dark economic outlook become hilarious. One helpful person has fed it into Twitter app Liblr which searches for any given word then replaces it with another. The weird but sometimes genius results are here. Incredible the difference a single letter makes!